Tried to book a ticket for the advertised price and been stung with extra "service fees"? Join the queue. 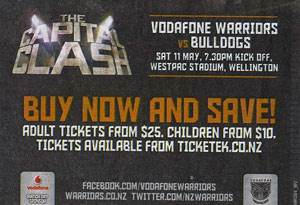 Anyone who wanted to see the Warriors vs Bulldogs game in Wellington last month would have found it impossible to pay only the advertised $25 (see ad below). When you went to book, you discovered there was also a minimum $5.25 “transaction fee”, making the price of a single ticket $30.25. That went up to $33.25 if you wanted to pick up the ticket from the venue. But the ad doesn't mention any of these extra charges. We think that's misleading. Companies should disclose the total cost upfront. Don Mann, the Warriors General Manager Commercial, told us there should have been a “booking fee applies” statement in the ad. He said the company had used this clause in the past and “will ensure it is reinstated”. We'll be highlighting examples of misleading pricing as part of our campaign to force companies to come clean on costs. We'll also keep pushing for "all-inclusive pricing" rules.